Mount Claremont is a pleasant suburb about 8 km west of the center of Perth and about 2 km from the ocean. Through the middle of the suburb, for about 1.5 km, runs a major street called Montgomery Avenue. It is true to its name - it is lined with trees. Most of these are spotted gums (Eucalyptus (Corymbia) maculata) but there are also some pink-flowered white gums (Eucalyptus leucoxylon 'rosea') planted beneath some high-tension power lines, a few Norfolk Island Pines, and a couple of other eucalypts. However, the reality doesn't match the intention. Many of the trees are very sick. Their tips have died back so the canopy has a twiggy appearance (left photo). The leaves are also slightly pale. This photo was taken with back lighting to show the twiggy tops so the pale leaves are not apparent. Later there is a comparison of leaves from a sick and from a healthy tree. I have walked or driven along this avenue at least once a day, every day, for the last 11 years, and, to my shame, never paid much attention. I thought that the ill health was simply another manifestation of fungus-induced die-back. This is certainly present in Perth suburbs However, I would expect a fungus infection to be roughly circular, whereas the current affected area is linear. After reading Jim McNamara's article about Mundulla Yellows in the September 2002 of Australian Plants online, I looked at the trees in the avenue more closely. Most of them are planted in lawn and the lawn is watered during the (rainless) summer. 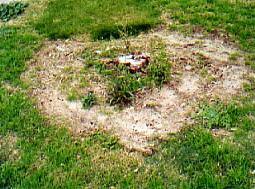 Some of lawn edges, plus the grass growing around the bases of the trees, is killed by spraying so that there is a neat bare annulus around the base of each tree. This spraying is done by contractors to the City of Nedlands. Officers of the City say that the contractors use glyphosate and are not permitted to use herbicides containing simazine or atrazine. 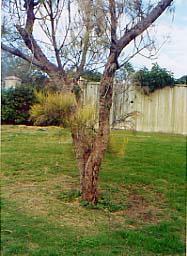 Nevertheless, the symptoms in the spotted gums are very similar to the known symptoms of simazine poisoning. Simazine is absorbed by roots, moves upwards and accumulates in the new growth. It inhibits photosynthesis but the veins remain green. Eventually the leaves turn brown and die. Some 26 of the trees are, in contrast, planted into a bed of grevilleas. It is obvious that the trees planted into the grass are much sicker than those planted into the grevilleas. Trees growing in private gardens a few metres to one side of the avenue are generally healthy. So to explain the ill health as caused by fungi, we would need to postulate a fungal patch about 1 km long, a few tens of metres wide and more severe in grass than in grevilleas. Pretty unlikely. Spotted gums are popular with many local authorities. They usually grow quickly with nice straight boles and require little attention. So it is easy to find other plantings to check out for symptoms. I looked at several other plantings and found none with similar symptoms - and in none of these plantings was there any evidence of spraying to control weeds. Most relevant is a row of spotted gums in nearby Cleland St. These are growing in unwatered grass and the bases of the trees have not been sprayed. As is shown above, the tops of the trees are healthy. Also relevant is a planting in Kings Park in what was once the Hale School oval. There, most of the spotted gums planted into watered lawn are very healthy - and all of the healthy ones have an untidy "stocking" of grass growing round their base. That is, they have not been "neatened" with an annular spray. Let us look at the symptoms more closely. Leaves from unhealthy spotted gums on right, healthy ones on the left. 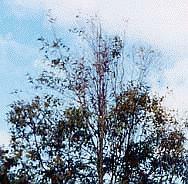 In Australia, eucalypt leaves are seldom without some kind of injury. Thus, the "healthy" spotted gum leaves all show some sort of damage. 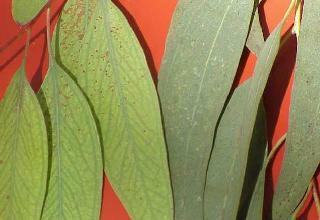 In the right-hand photo, the left-most leaf has some yellowish patches near the sites of insect attack. 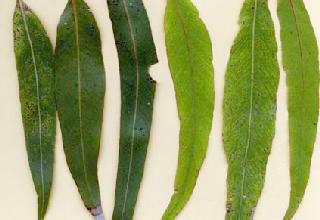 In contrast, the unhealthy leaves all have an inter-veinal chlorosis which is similar to that of the Mundulla yellows leaves in the left picture. Is there any more direct evidence of a relation between spraying and yellowing? The smoking gun? 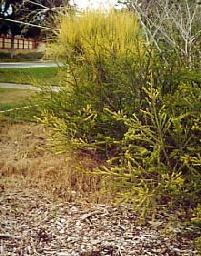 (above left) At the edge of Montgomery Avenue, sprayed grass beneath yellowed sheoak (Allocasuarina fraseriana) and wedding bush (Ricinocarpus tuberculatus). Unsprayed grass is visible in the background. Nearby sheoak plants without dead grass beneath them are normal green. The next stage? (above centre) Very sick sheoak with a ring-a-mortis around the base. This tree is just off Montgomery Avenue. Sheoaks in land adjacent to Montgomery Avenue grade from sick/dead to healthy depending on the distance from treated areas. The final stage? (above right) The remains of an adjacent tree - probably a banksia also with an obvious ring-a-mortis. Would treatment with glyphosate maintain a dead ring for this long? I think this is further evidence that simazine has been used. The worst affected trees are removed and replaced with new specimens from the nursery. Consequently, I could not photograph the very worst examples. Even so, the spotted gums in the background of the far left hand photo are unhealthy (the dark trees in center background are Norfolk Island Pines). The replacement trees (near left hand photo) are placed in the same spot from which the previous trees were removed. 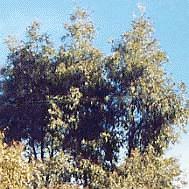 These replacements are tuart (Eucalyptus gomphocephela). And ring spraying is continued. As can be seen, the outcome for this earlier replacement (a spotted gum) is not very satisfactory. Many trees in and near Montgomery Avenue are very sick. The pattern of occurrence is not compatible with fungus attack but there is a strong association with the use of herbicide. The symptoms are consistent with the use of simazine but Council officers deny that it is used by the current contractors. The above observations were made in winter 2002. In spring 2002, most of the trees looked a lot better and showed a spring flush. However, the ring around the base has been re-sprayed. In contrast to previous occasions, it looks like they really have been sprayed only with glyphosate this time - the grass is haying-off rather than going yellow. We shall see whether the trees suffer another episode of die-back after this spraying.